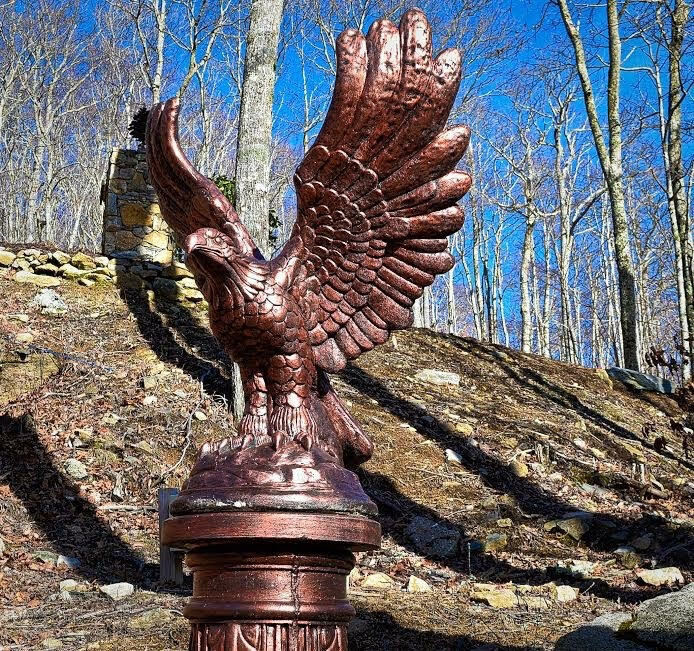 We know finding a spot to charge your vehicle can be challenging while here, but for those staying in Eagles Landing, there is now a charging station in the garage. 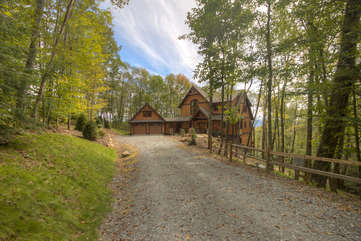 Just throw your bags in your Tesla and head to the mountains! 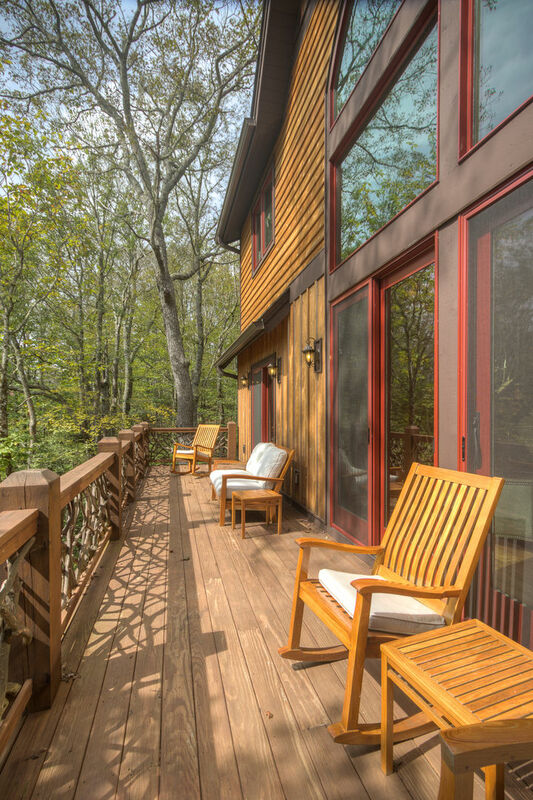 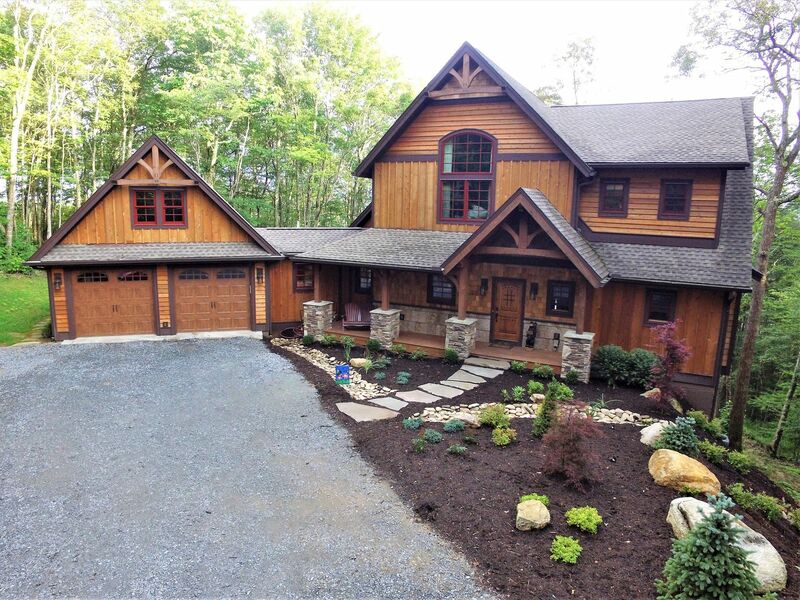 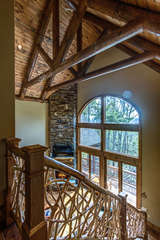 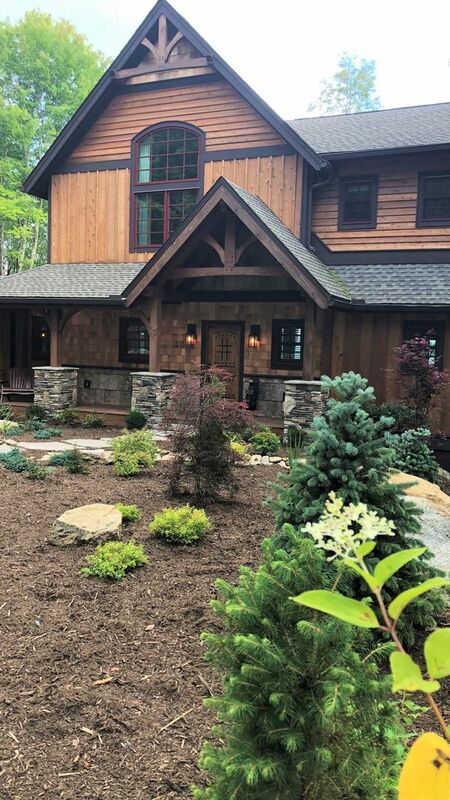 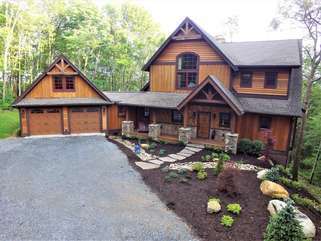 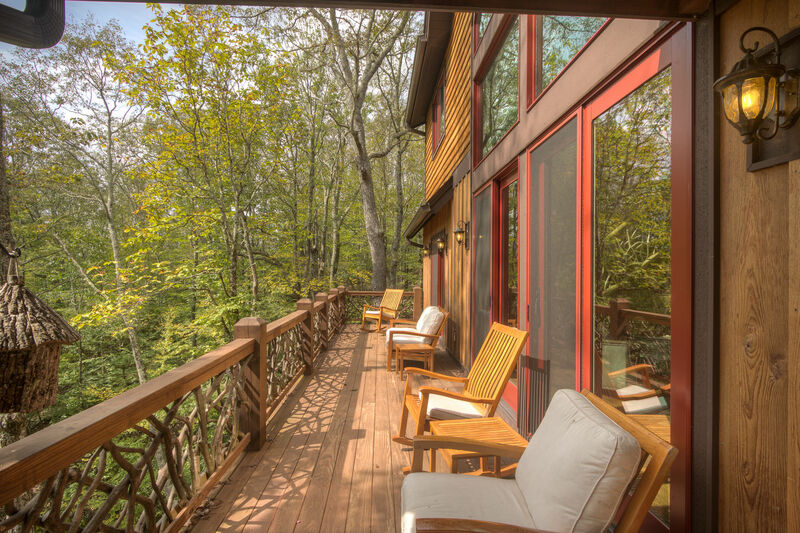 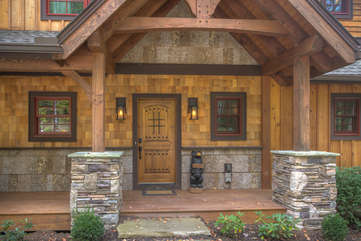 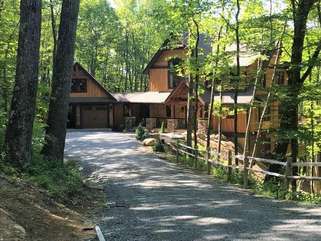 Welcome to Eagles Landing, a custom-designed Banner Elk vacation rental perfect for families or adult groups looking for something special. 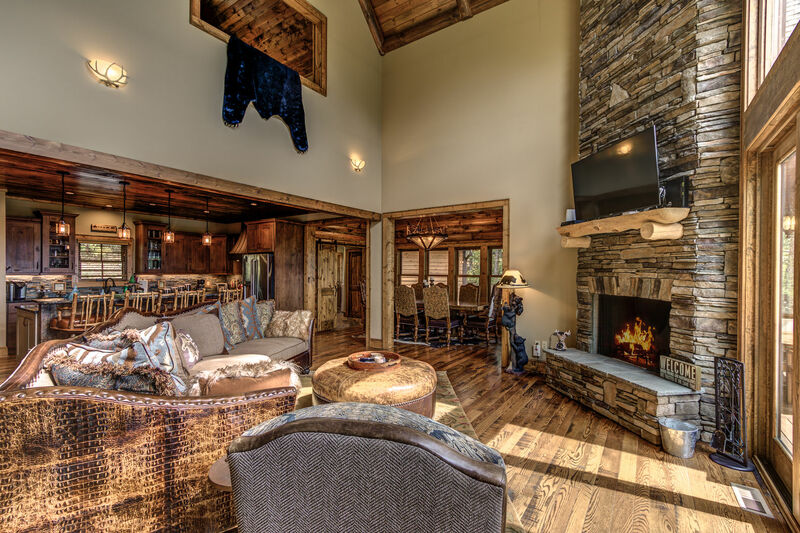 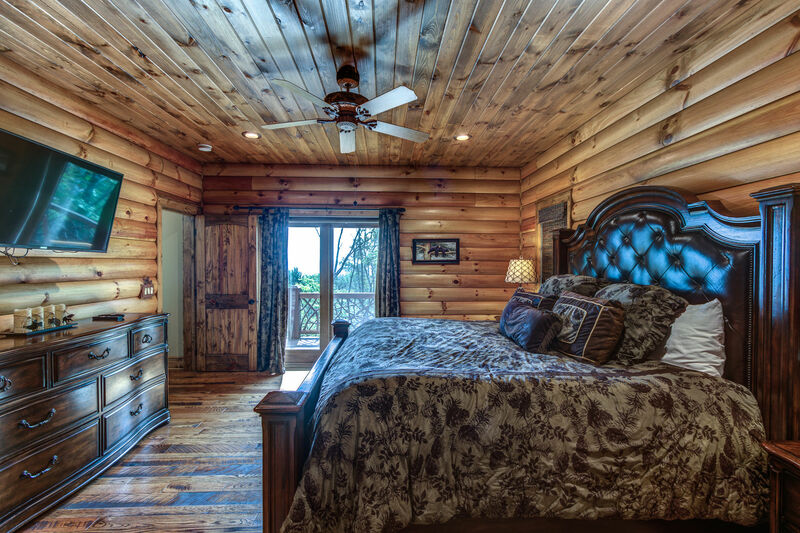 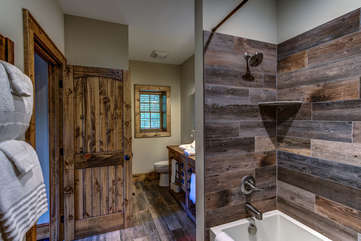 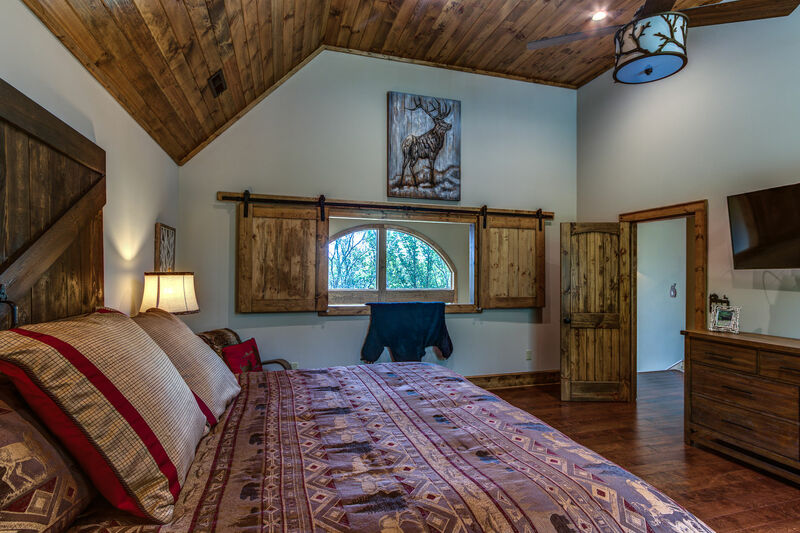 For those who think there is no such thing as affordable luxury rentals in the High Country, all we can say is you have yet to experience this new vacation home in The Lodges at Eagles Nest! 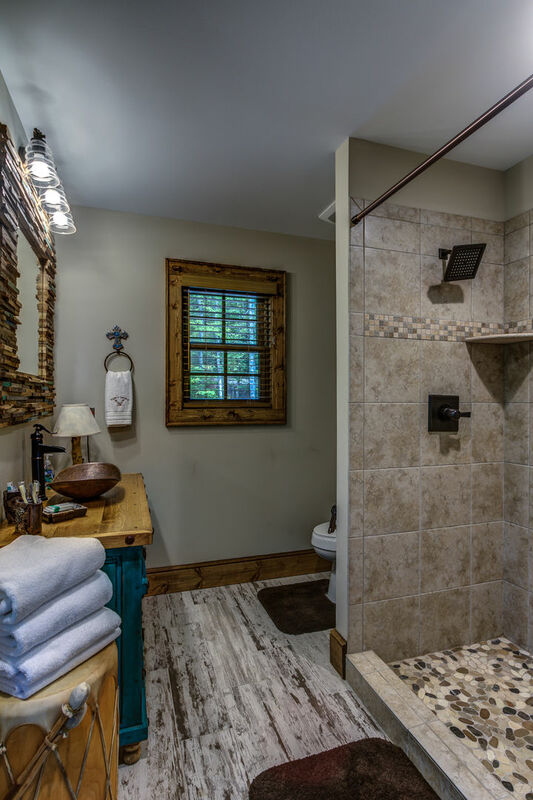 Designed by the homeowner especially for those seeking something extra for their next getaway, this home does not disappoint, inside or out. 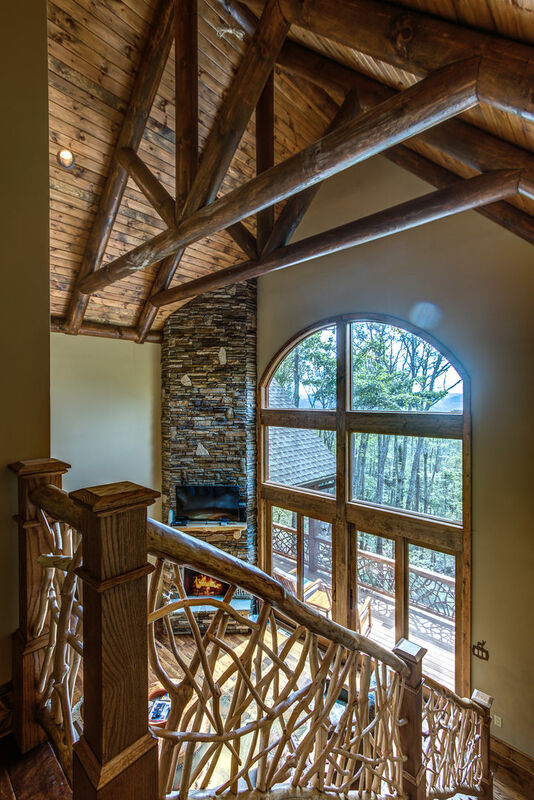 Once you pass through the towering cedar gates into Eagles Nest, you sense immediately you have arrived somewhere very special. 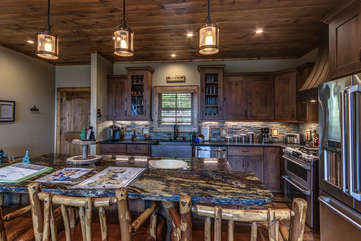 The attention to detail throughout this community is obvious wherever you look, from the hand-stacked stone walls to the paved road meandering past boulders and overlooking amazing vistas. 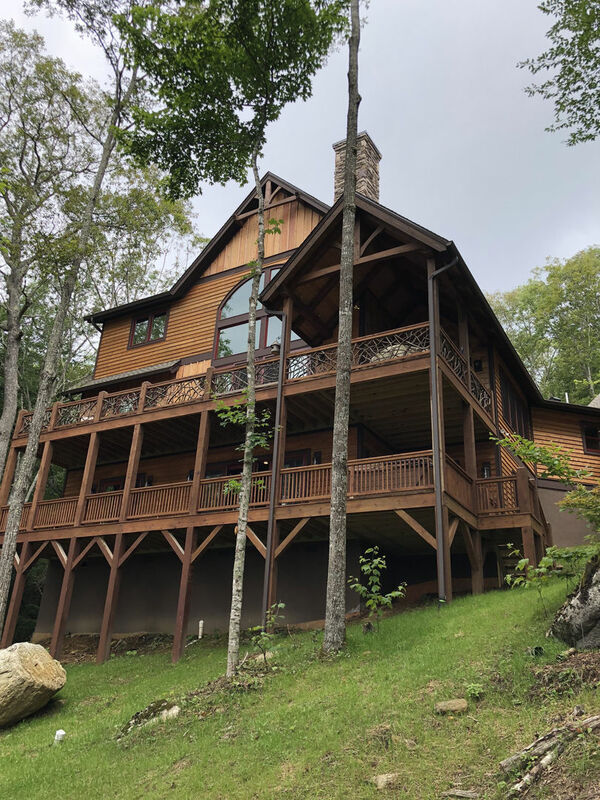 Just after passing the popular Great Camp area, you will arrive at Eagles Landing – nestled in the trees yet still offering wonderful views from the decks. 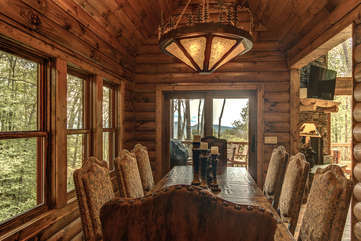 No detail has been overlooked in this Eagles Nest luxury rental. 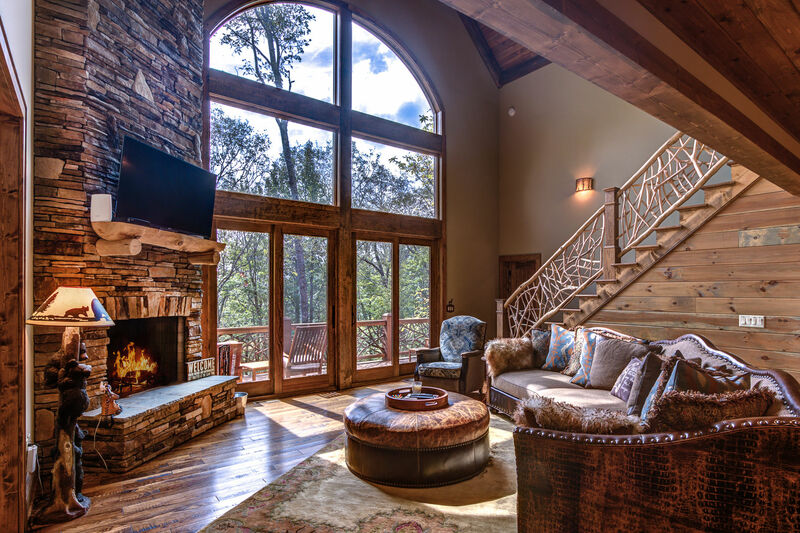 From the 30 foot stone fireplace and wall of windows looking out to the view, to the custom made furniture and fixtures, to the location – when you find Eagles Landing, you have found it all. 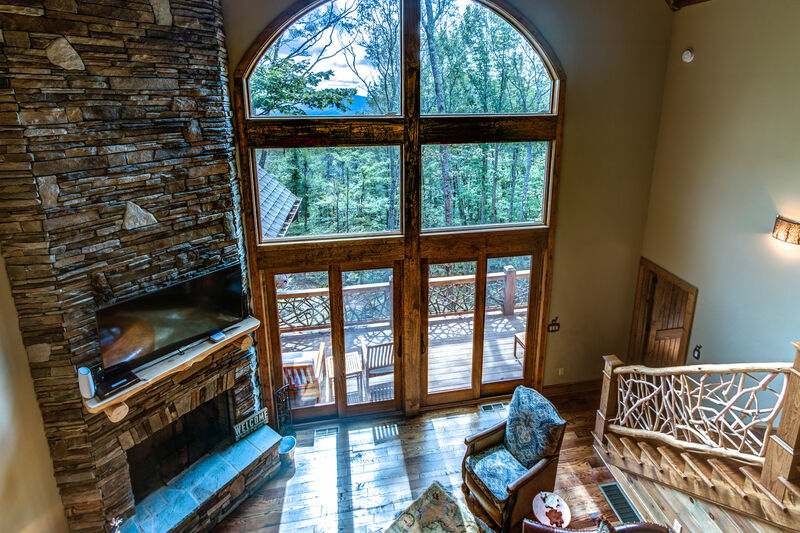 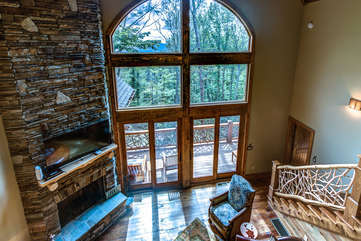 The living area, once you look away from the view, offers a custom sofa that is the epitome of mountain style, natural stone fireplace, rhododendron railings, and access to the deck that will summon you again and again to take in this little bit of paradise. 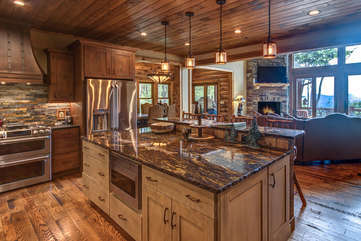 The well-planned kitchen will have everyone wanting to serve as chef, with large farmhouse-style copper sink, gas range with hammered-copper hood, simply beautiful granite counters, custom cabinets and all you could desire to prepare meals. 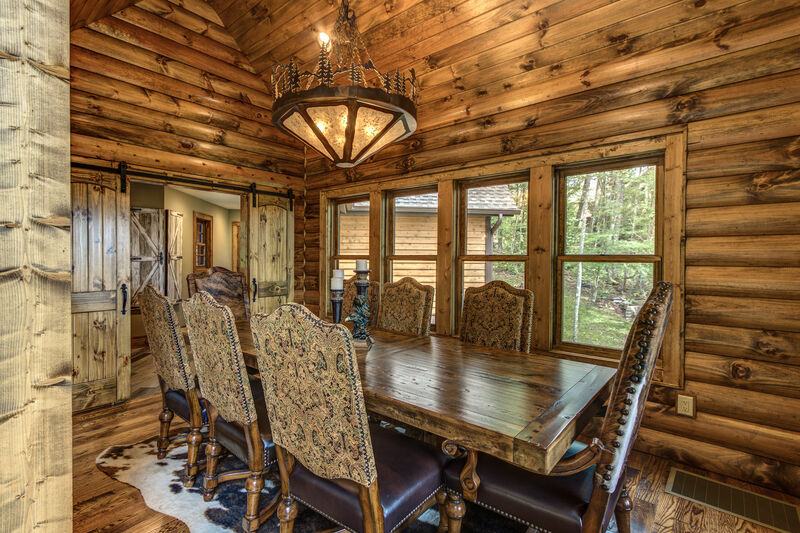 When everything is ready, the large dining table with custom seating awaits, providing room for all – with a view! 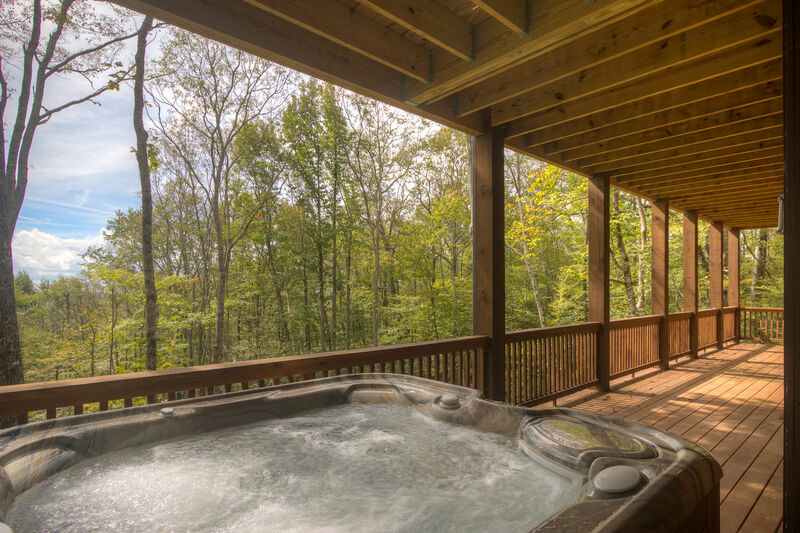 After dinner, enjoy your evening cocktail or coffee on one of the two decks, where you can take in the mountain vistas, passing wildlife, or take the kids out with you and just try to count all the stars! For another option, head down to the large family room and enjoy your choice of entertainment – a custom log pool table, foosball, large screen television and more await. Some may sit and catch up on the comfy furniture while others find their game of choice – show the kids your teenage favorite on the 60-game video arcade, let them show you their favorites on the PS4, or slip out onto the deck for a soak in the hot tub. Dart tournament? 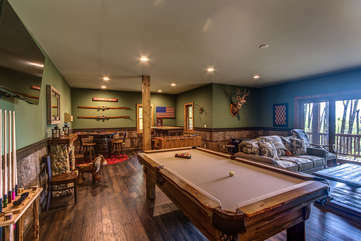 No problem – and the scorekeeper can even sit at the custom Eagles Landing whiskey barrel pub table. 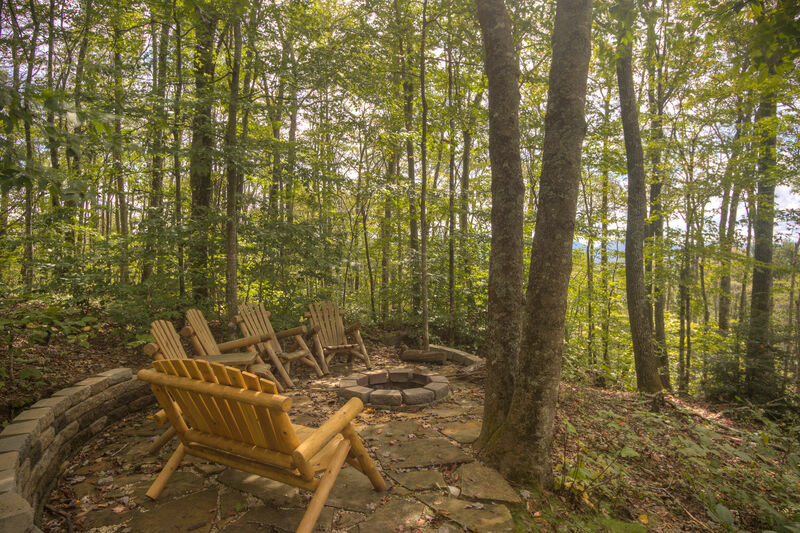 Outdoor options await as well – the fire pit is the perfect spot for roasting s’mores while reliving family or college memories. 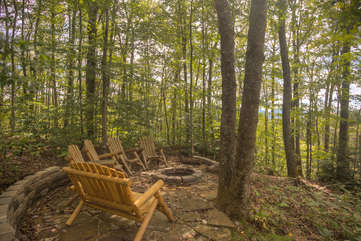 The Great Camp area is also just a short walk away, with a ropes course popular with the kids, the Great Field, and access to some of the many trails within Eagles Nest. 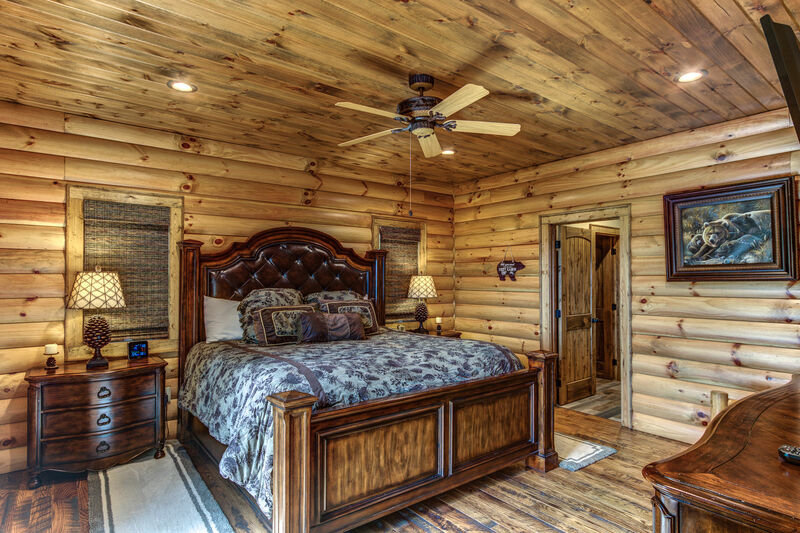 After all this fun, when it is time to turn in the bedrooms will not disappoint. With three masters and an amazing bunkroom for the kids, who wouldn’t be ready to hit the hay?! 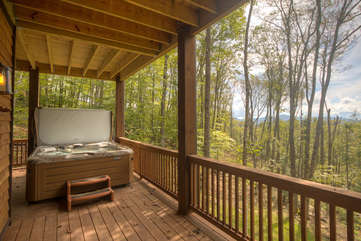 The first master is on the main level, with king bed, views, deck access, and an amazing master bath. 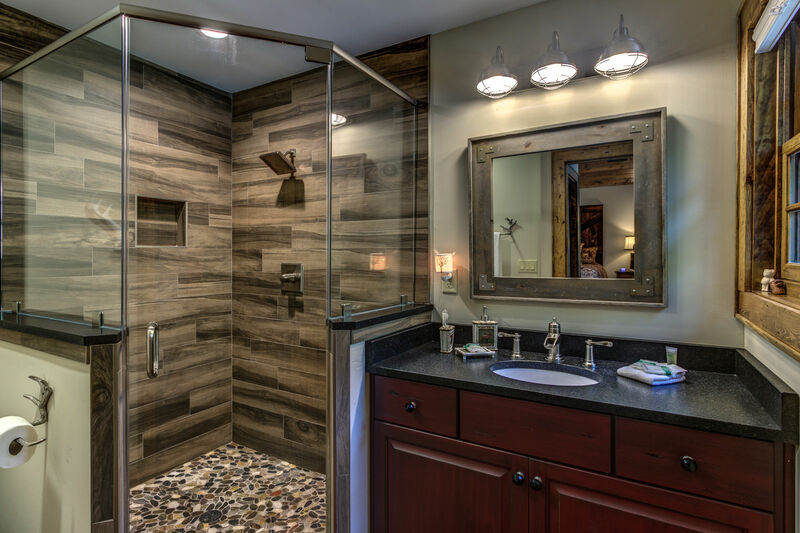 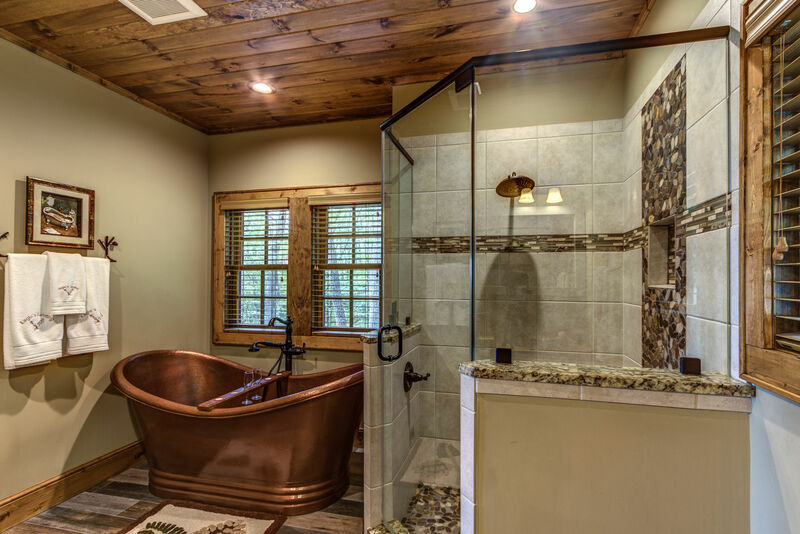 Some may prefer the tiled walk-in shower, but be sure to allow yourself time to enjoy a soak in the hammered copper tub, big enough for two! 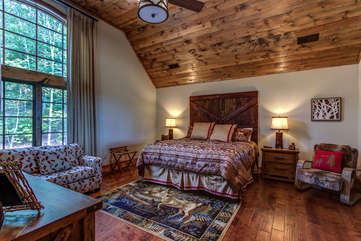 Upstairs you will find two additional master bedrooms, each with king bed and private bath. And downstairs, the kids will be racing to claim their bunk. 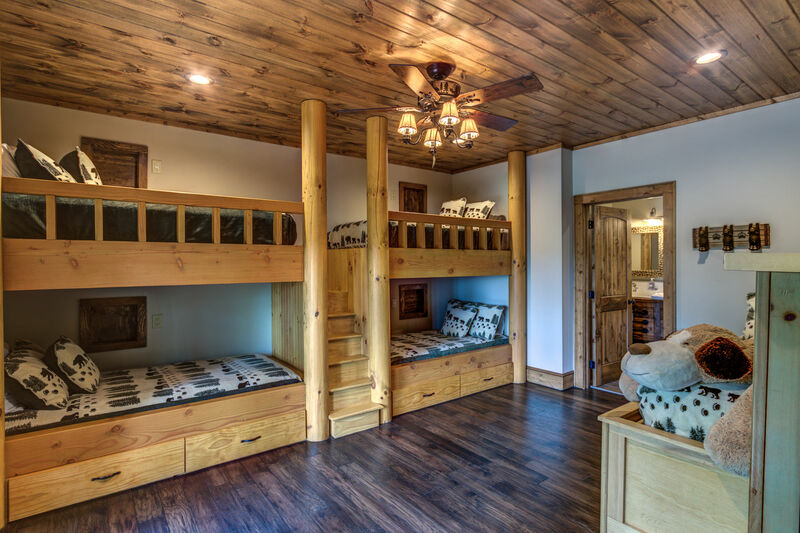 With a double set of custom log bunk beds, there is room for four, or take advantage of the twin trundle for the younger kids who may not care to try out a bunk quite yet. 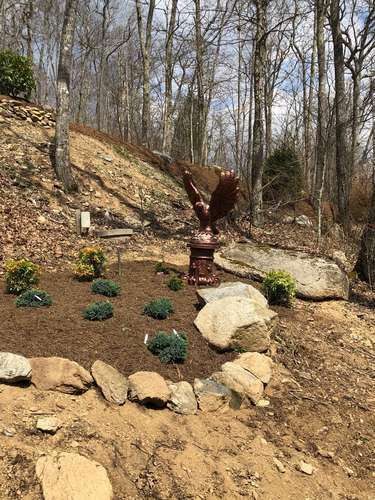 Even with all there is to do in Eagles Landing as well as within the Eagles Nest community, you may eventually decide to venture out and see the rest of our area. The location is ideal, with Beech Mountain and Sugar Mountain so close (mountaintop yoga and bike trails in summer, scenic lift rides in summer and autumn, and amazing winter recreation including skiing, snowboarding, ice skating and tubing); experience the shops, dining and events in the bucolic downtown areas of Banner Elk, Valle Crucis, Boone and Blowing Rock; or just take a scenic drive along the Blue Ridge Parkway. 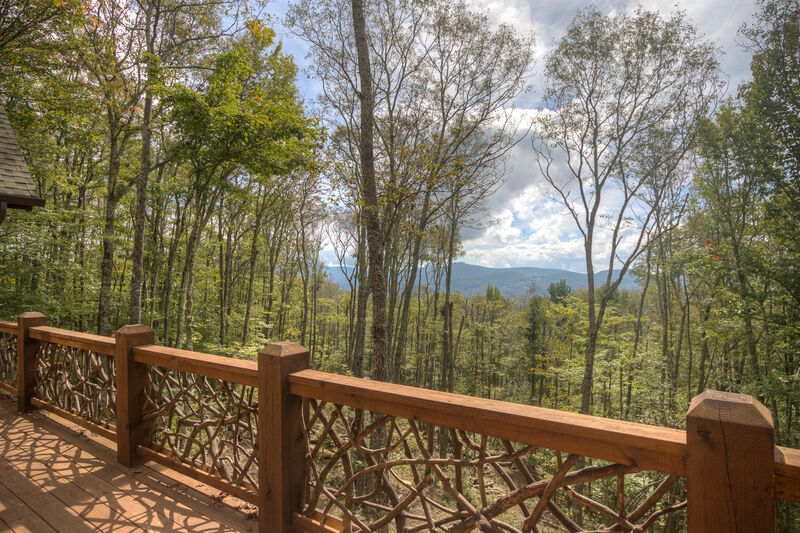 Our area is abundant in natural beauty and recreation any time of year, so there are multiple options for golf, fly fishing, hiking, antiquing and more. 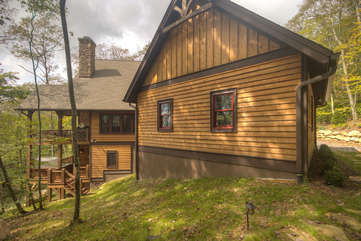 Need some suggestions or help narrowing down the choices? 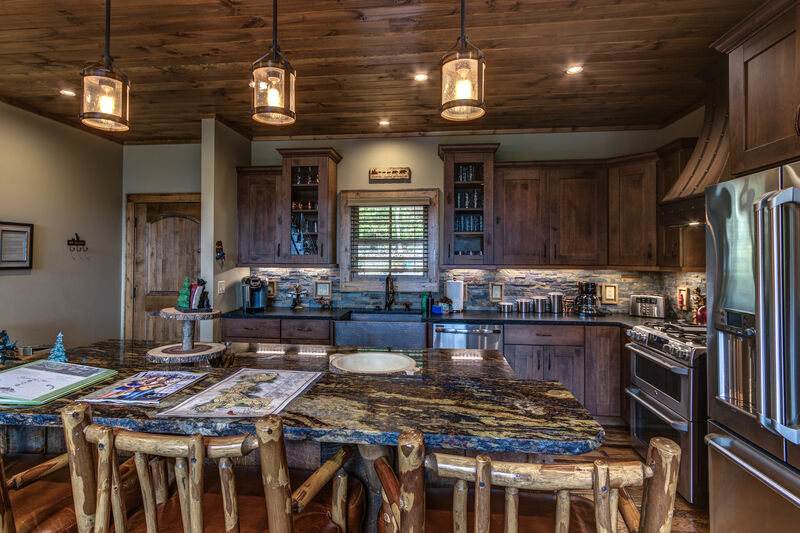 Just give our office a call and our staff will be happy to help! Within the Eagles Nest resort, guests may enjoy outdoor adventure and entertainment throughout the year. 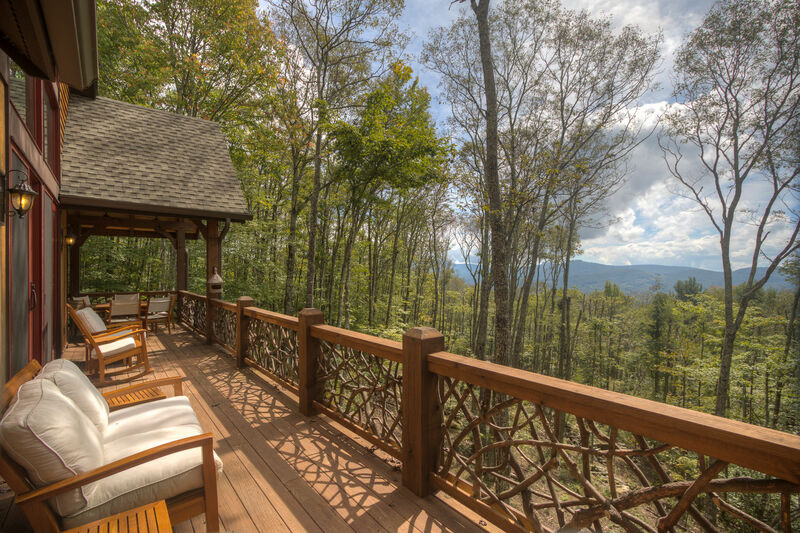 Live music, hiking and atv trails, playgrounds and more await, all with family fun and exploration in mind. 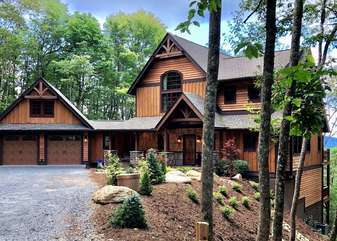 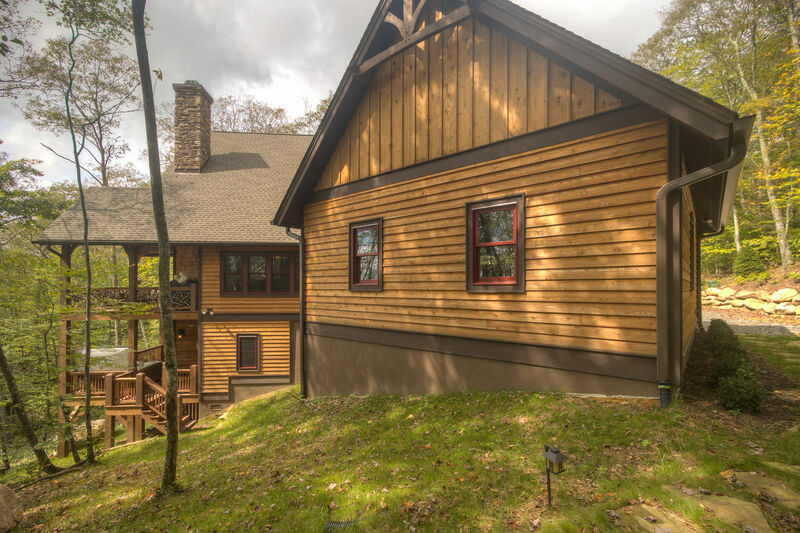 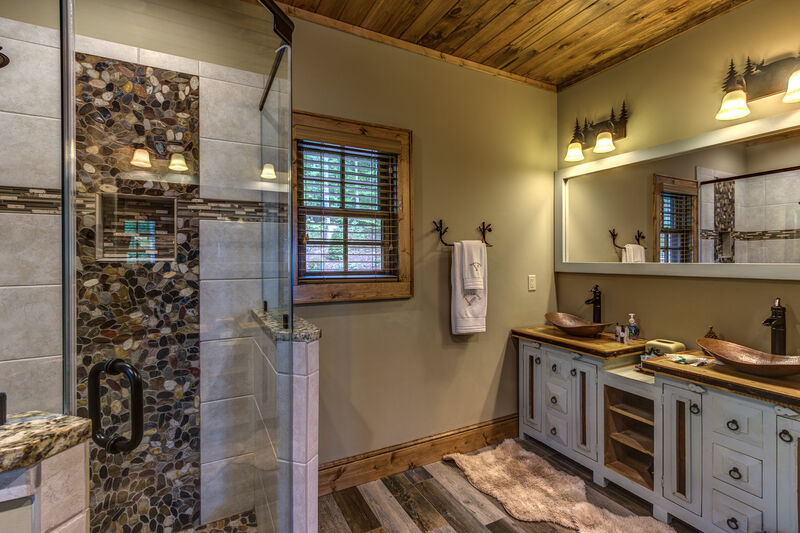 When you are ready to plan your next Blue Ridge Mountain vacation, Eagles Landing in The Lodges at Eagles Nest is ready to host your family with all a vacation home should offer - and more! Large master bedroom with king bed and deck access. 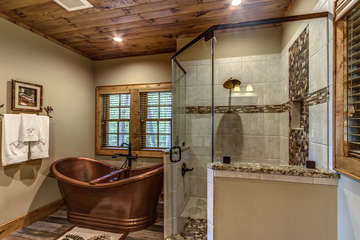 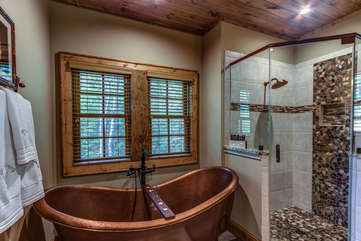 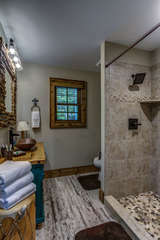 Stunning master bathroom including large copper soaking tub and separate walk-in tiled shower, plus private deck area. 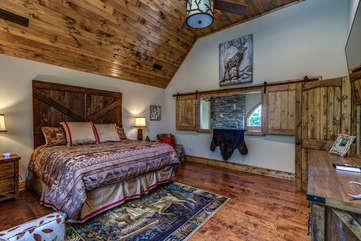 Second master bedroom with king bed and full bath. Third master bedroom with king bed and full bath. 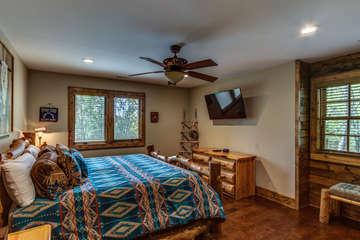 Bunkroom with four twins plus twin trundle. 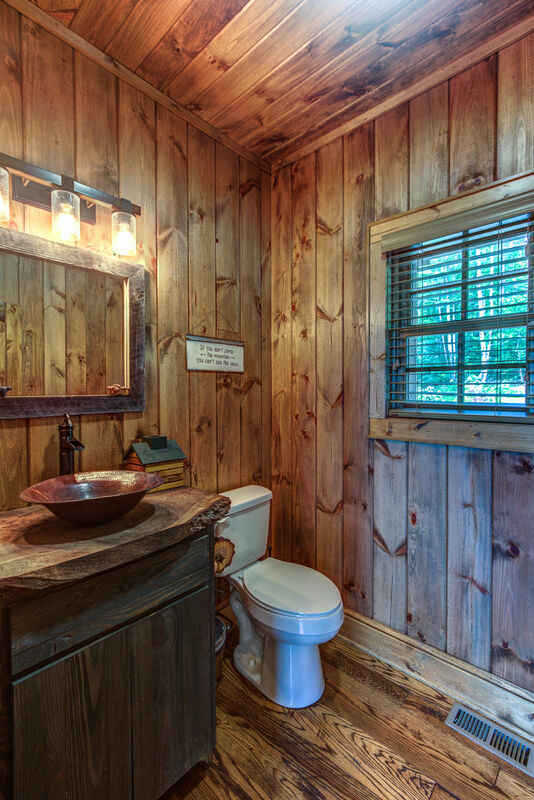 Each bunk has its own charging station built-in. This home has paved access all the way to the driveway but will require 4wd and/or chains during winter conditions due to elevation. Often thought of as the heart of the resort, the Great Camp area features a ropes course, disc golf, climbing towers, playground, archery area, horseshoes and access to some of the hiking trails. 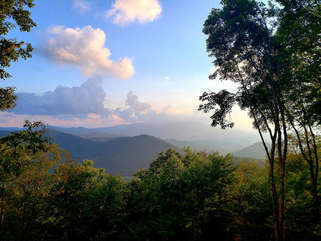 The Summer Concert Series on weekends between Memorial Day and Labor Day includes great music, children’s games and concessions. 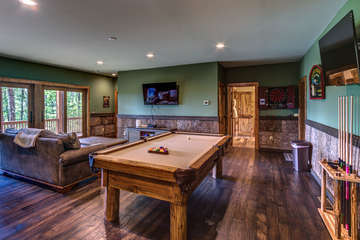 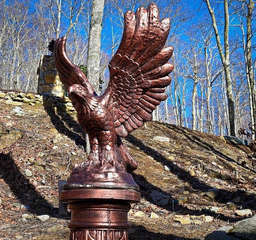 The more recent addition of the North Pavilion has added even more fun to The Lodges at Eagles Nest! 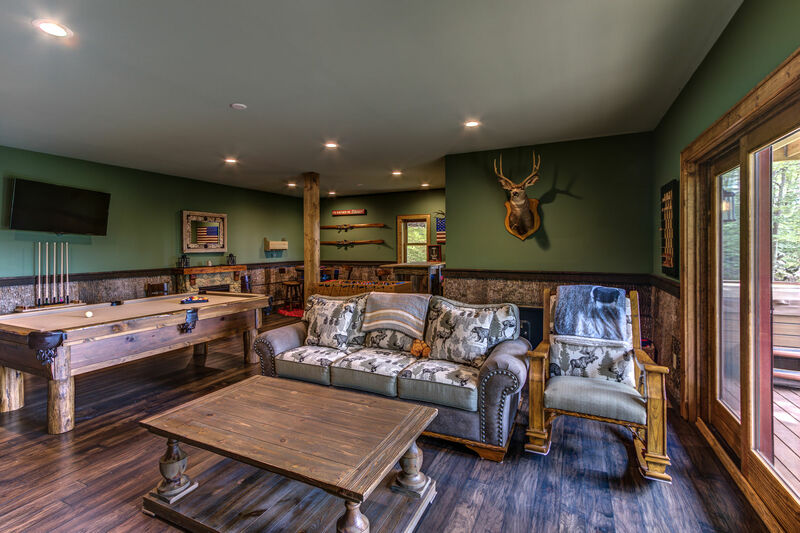 Here you will find the paintball course, ball field and sports court, dog park, archery/rifle range, equestrian trails, firepit, more hiking trails and in Winter, snow tubing and sledding. Another amazing and unusual amenity at Eagles Nest is the Boulder Park, a ten-acre conservation area featuring large granite boulders and rock outcroppings. 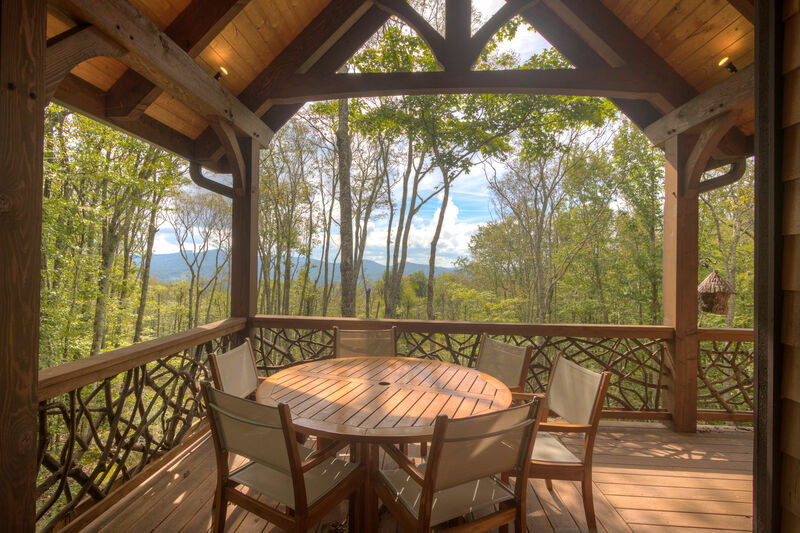 Take in the natural beauty on a hike or plan on a bit of rock climbing – and don’t miss those views of Grandfather Mountain! Although frequently sought out, UTV/ATV trails are a scarce commodity in the High Country. 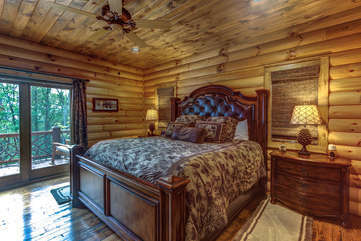 But not in The Lodges at Eagles Nest! 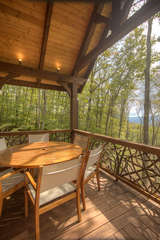 There is an extensive trail network to explore the forests, valleys and ridgelines in Eagles Nest. So, plan on bringing your UTV/ATV for your next visit.